“Injuries and illnesses kill about 2.2 million people in the world each year“, ILO. In the U.S., about 1/3 of all injuries and 20% of injury deaths occur at home. Safe practices at work, home, and play can prevent many injuries, illnesses, and deaths. However, once injury or sudden illness has occurred, effective first aid can make the difference between a rapid or prolonged recovery, a temporary or permanent disability, and even a life or death. Patients Helping Hands (PHH) is a Sindh Medical College student operated NGO which aims to serve patients simultaneously in the three hospitals, the college is affiliated with namely National Institute of Child Health (NICH), National Institute of Cardio-Vascular Diseases (NICVD) and Jinnah Postgraduate Medical College (JMPC). PHH is a non-political, non-sectarian, entirely student-run welfare association with mission. Patients’ Helping Hands (PHH) is the brainchild of those individuals who are committed to service to humanity. This first ever student run welfare organization has been started to allow students of medical colleges a chance to partake in welfare work. This organization will serve as a platform for the SMC student body to serve humanity and their own conscience and will provide the same opportunities which PWA provides to the students of DMC. “Lend a Hand to Make a Difference”. They have already initiated several projects in JPMC and NICH, the details of which can be found on their Facebook page. Helping them is putting ourselves in good hands. First Aid to Save a Life do conduct trainings on commercial terms but often conducts no-profit no-loss training sessions to spread the awareness to learn life saving skills and techniques to take care of your loved ones, to help your community where you live and work. 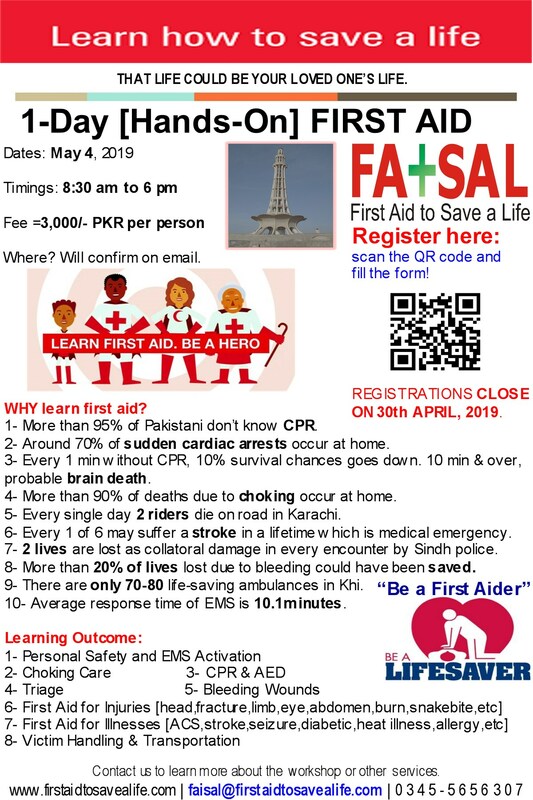 First Aid to Save a Life is also doing their best to bring the international certifications in CPR, First Aid, AED and Emergency Services in Pakistan. This entry was posted in First Aid CPR and AED and tagged AED, CPR, Dow University Of Health Sciences, Emergency Services, Emergency Training Services, FATSAL, first aid, first aid to save a life, Fund-based Organizations, Fund-based Organizations in Pakistan, http://www.patientshelpinghands.org, Jinnah Postgraduate Medical College, National Institute of Cardio-Vascular Diseases, National Institute of Cardio-Vascular Diseases (NICVD), National Institute of Child Health, NGOs working in Pakistan, NICH, NICVD, Patient Welfare & Volunteer Services, Patients Helping Hands, PHH, Sindh Medical College, Sindh Medical College (SMC), SMC, Student run NGO, Students of Dow University Of Health Sciences, Welfare Associations in Pakistan. Bookmark the permalink.